Gregory Rabassa’s influence as a translator is tremendous. His translations of Gabriel García Márquez’s One Hundred Years of Solitude and Julio Cortázar’s Hopscotch have helped make these some of the the most widely read and respected works in world literature. (García Márquez was known to say that the English translation of One Hundred Years was better than the Spanish original.) 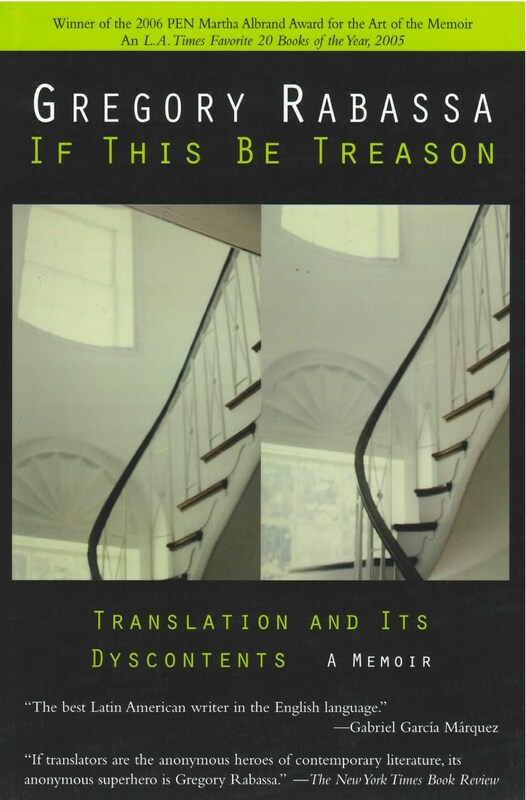 In If This Be Treason: Translation and Its Dyscontents, Rabassa offers a coolheaded and humorous defense of translation, laying out his views on the translator’s art. Anecdotal and always illuminating, Rabassa traces his career from a boyhood on a New Hampshire farm, his school days “collecting” languages, the two and a half years he spent overseas during WWII, and his South American travels, until one day “I signed a contract to do my first translation of a long work [Cortázar’s Hopscotch] for a commercial publisher.” Additionally, Rabassa offers us his “rap sheet,” a consideration of the various authors and the over 40 works he has translated. This longawaited memoir is a joy to read, an instrumental guide to translating, and a look at the life of one of its great practitioners. A fine summing-up by the translator who brought…Márquez and Julio Cortázar to the attention of English-speaking readers.